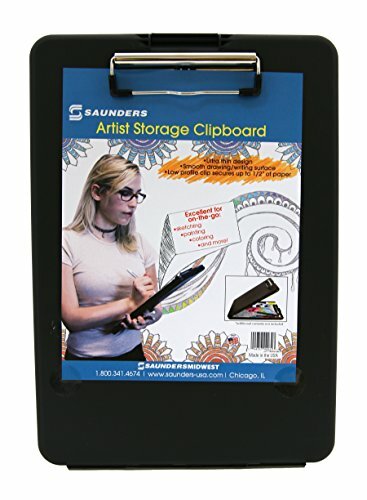 This lightweight, durable, bright colored, plastic storage clipboard is perfect for artists of all skill levels. The ultra thin body and smooth drawing/writing surface makes this clipboard the perfect go-to storage compartment for all of your artistic needs. Top open easy one-handed access to 3/4" storage compartment with a snap closure that keeps materials such as pencils, scissors, drawing pads, paint brushes, etc., protected from impacts and the elements. Proudly manufactured and assembled by Americans who are blind or disabled. Premium low profile clip that holds artist media up to 1/2" thick. Dimensions: 8.5 inch x 12 inch. Top open easy one-handed access to 3/4" storage compartment with a snap closure that keeps materials such as pencils, scissors, drawing pads, paint brushes, etc. Proudly manufactured and assembled by Americans who are blind or disabled.